New driveline for a longer service life. The latest development from Pottinger is the NOVACAT A10 mower combination which is packed with advanced technology. Clearly setting new standards in terms of service life, reliability, cost effectiveness and convenience. The NOVACAT A10 can be used as a front/rear combination (headstock for 3.0 or 3.5 m front mower) and is extremely versatile: a side shift range of 400 mm on either side ensures ideal overlap and perfect mowing quality. The high ground clearance when raised at the headland of up to 55 cm offers hassle free operation. In addition, the new Y DRIVE driveline and the hydraulic NONSTOP LIFT collision safety device on each side are also unique to this new model. The mower combination is available either as a plain disc mower with swath formers, with ED tine-type conditioners or alternately with RCB roller-type conditioners. Hydraulic cutter bar weight alleviation and suspension is included on all models. The NOVACAT A10 has a rugged carrier frame with a quick-hitch compatible. In combination with a 3 m front mower, overall working widths of 8.80 m to 9.56 m are possible. In this case, the central gap between the two mower units is 1.8 m to 2.6 m. combined with a 3.5 m front mower the overall working width is 9.26 m to 10.02 m. Here the central gap between the two mower units is 2.3 to 3.1 m.
The special Y DRIVE central input gearbox features output shafts on opposing sides. 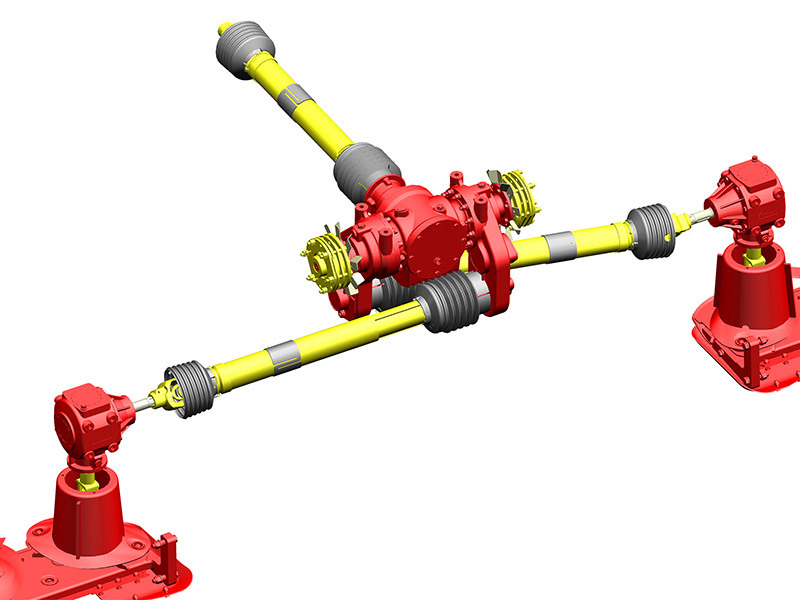 This has the advantage that longer standard PTO shafts can be used with less of an angle. The backlash and vibration free driveline using standard PTO shafts has been made possible by locating the slip clutches next to the gearbox and by optimising the gear ratios. A double universal jointed shaft in the inside mower disc and drum assembly provides a stress-free link between the individual mower gearboxes and the cutter bar. The result is a smooth running system that offers a higher output, even in tough Conditions and when raised in the headland position. This additionally extends service life significantly. NONSTOP LIFT is an innovative technology that protects the cutter bar in the event of striking an obstacle. Fitted to both sides, the collision safety device enables the cutter bar to avoid obstructions efficiently. The unique feature sees the mower frames mounted on gimbals and is hydraulically preloaded by a triangular support arm. The triggering pressure is displayed by a conveniently located pressure gauge and is easily adjusted. When triggered, the mower frame folds backwards on the triangular frame and is simultaneously raised at the front by the gimbals – the result a three-dimensional collision safety system. The mower avoids impact with the obstruction so that damage to the cutter bar is prevented particularly when operating at higher driving speeds. The heart of the mower combination is the NOVACAT cutter bar proven thousands of times in the field with quick-change blade system as standard. Tapered disc surfaces, optimised counter-chop zone and generous overlap of the blade paths ensure perfect crop flow, first-class cutting quality and simultaneous optimum protection of the sward. Offering a transport height of 4.0 m, transport width of 2.7 or 3.15 m and a ground clearance of at least 28 cm, the NOVACAT A10 is compact during transport. Because the centre frame is at its lowest point in transport position, there is no risk of damage to any vital driveline components. The POWER CONTROL control terminal is fitted standard for New Zealand which features Load Sensing compatibility, ISOBUS control of all functions, direct control via the terminal (e.g. front mower, weight alleviation, etc.) as well as control of the working width based on the ISOBUS turning angle signal from the tractor. Integrated maintenance management functions are incorporated dependent on the operating time of the mower driveshaft, the control terminal displays which maintenance steps need to be performed on the machine. Pottinger, the world’s No. 1 for front-mounted disc mowers.